Adrian Moore, Bernice Mills and Tracy Johnson of Lodge Brothers, all helped bring the ‘Magic of Christmas’ to Yiewsley High Street last weekend by taking part in the Yiewsley and West Drayton Town Centre Action Group (YWDTCAG) Christmas Festival. On the afternoon of Saturday 6th December hundreds of people from the local community flooded into Yiewsley Town Centre to enjoy the Christmas market and to wait for Father Christmas to arrive on his boat and hand out gifts to the local children. Lodge Brothers sponsored a stall and handed out hot chocolate with marshmallows and hot mince pies to local residents and families; there was also a ‘guess the number of sweeties in a jar’ competition. The Christmas treats were incredibly popular with over 500 people visiting the stall and even Father Christmas dropped in to warm up and enjoy a hot chocolate. 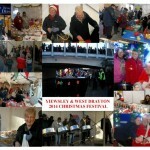 There was a fantastic festive atmosphere with Christmas songs playing and the high street full of community spirit. This year all donations raised at the festival will go to Michael Sobell House, the Mayor of Hillingdon’s chosen charity. John Davis, Chair of YWDTCAG commented at the event, “It’s just wonderful that Lodge Brothers have offered to be part of this year’s event. We really hope that it encourages other businesses in Yiewsley to get involved”.